He married Rufina Monteagudo Ponce in 1933, and after war broke out in 1936 he fought with the libertarian militias. After the war, Basiliso returned to his home village, and fearing reprisals from the fascists, he fled into the nearby mountains, where he was soon joined by his wife, sister and nephew. He joined the illegal anti-franquist guerrillas in 1946, and continued to fight the state forces for nearly six years in skirmishes. Basiliso, nicknamed El Manco de La Pesquera, quickly became a legendary figure in the area due to his Robin Hood-like raids on rich landlords and his assistance to the local poor. 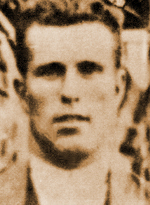 Under increasing pressure from the Franquist authorities, Basiliso finally decided to flee to France, but was apprehended by the Guardia Civil on April 27, 1952 in Confrentes (Valencia). Sentenced to death, he was executed in the military barracks in Paterna (Valencia) on December 10, 1955. Basiliso was buried in an unmarked grave in Paterna, but his remains were recently exhumed (in 2005) and returned to La Pesquera to be interred in the cemetery of his native village.